The best would be to use a 0.5 mm roller. 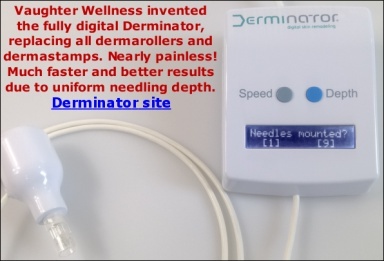 Dermarolling speeds up the skin's turnover and that should help keeping the pores clean even though it cannot completely solve this problem. One of the best substances to clean pores is salicylic acid because this beta hydroxy acid penetrates the pores and cleans them. Repeated and regular use is necessary. A-Ret should also help but initially it may make acne or blackheads worse (it pushes them up). You have to be patient and continue. Exfoliate the skin with baking soda. Wet your face, put baking soda on your face and gently massage with your fingers. Baking soda (aka sodium bicarbonate) falls under the category of physical exfoliants, and what makes it especially effective is that it is a fine, yet hard powder, making it highly effective at removing the dead skin cells without causing excessive irritation. Chemically speaking, baking soda is acid neutral, and acts a mild buffer which means that it has the ability to neutralize other substances it comes in contact with that are acidic (like vinegar) or basic (like soap). Many people also believe that baking soda has cleaning properties; however, scientific evidence has shown that this is due to baking soda’s physically abrasive nature, and it is not an effective anti-microbial agent. To reap the benefits of exfoliating with baking soda, add a teaspoon of the powder to your facial cleanser, mix well, and massage into skin like you would with a commercial exfoliant. Do this 2-3 times a week or as per your regular exfoliation routine. If you notice that your skin is red or irritated afterwards, try putting in less baking soda and use the treatment at night so that your skin has a chance to get back to normal while you sleep. Remember to always moisturize afterwards! While there are numerous testimonials in which people claim that baking soda cleared up their acne when nothing else helped, please remember to take these statements with a grain of salt. We don’t know what else that person had changed in their skin regimen; it’s possible that besides using baking soda they also started drinking more water, switched their cleanser or moisturizer, or maybe even changed the number of times they cleanse their skin per day. Seasonal changes and stress levels also have a very strong impact on how much and how noticeable your acne may be. However, there is some evidence that baking soda may be beneficial in treating acne since just the exfoliating properties of baking soda alone lead to an increased skin cell turnover rate making your acne look less noticeable. Plus, baking soda’s neutralizing properties maybe reduce redness of the skin also reducing the appearance of acne. If you want to try using baking soda as an acne treatment, my recommendation is to use one teaspoon of it in your cleanser at night to exfoliate your skin, as well as make a thicker paste of just baking soda and water and apply it to the acne as a mask for 5-10 minutes or overnight (beware, when it dries the mixture will crumble so you might up wake up to a messy pillow). Wikipedia states pH of baking soda is 8.